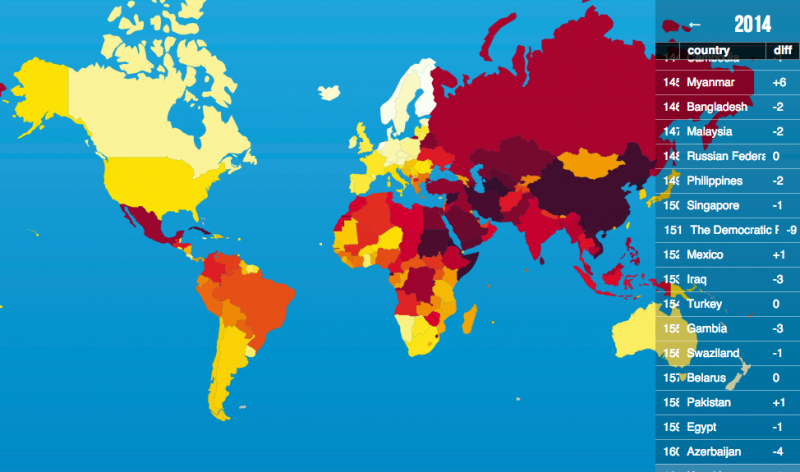 2014 World Press Freedom Index map by Reporters Without Borders. Reporters Sans Frontières recently unveiled the World Press Freedom Index for 2014, in which Mexico ranked #152 out of 180 countries. The non-governmental press freedom organization headquartered in France highlighted a “decline on all fronts” in this year's installment of the annual ranking. This was the western hemisphere's deadliest country for journalists in 2014 (for murders directly linked to media work). Murders, kidnappings, physical attacks and threats go almost entirely unpunished, fuelling fear and self-censorship. Collusion between organized crime and certain politicians and local officials hampers good governance and justice at all levels. The federal mechanisms for protecting human rights defenders and journalists are not effective or rapid enough to meet the needs of endangered journalists. The media landscape suffers from a lack of pluralism in the TV sector and the vulnerability of community radio stations, which are often denied legal frequencies and are subject to persecution. Mexico falls below other countries in conflict such as Afghanistan (#128) and Ukraine (#127), and far below neighboring Costa Rica (#16). Other countries in the Americas like Venezuela (#116), Honduras (#129) and Guatemala (#125) are also above Mexico in the ranking, but still reflect a dismal scenario for media workers. Cuba (#170) ranked lower in the index than any other country in the Americas but managed to climb one point from last year. Methodology on this sort of work is often the subject of controversy. This year, Reporters Sans Frontières changed their methods in an effort to better adapt to all the situations that “journalists, news media and bloggers may have to face.” The index is developed out of a questionnaire answered by correspondents, partner organizations and even jurists and human rights defenders, according to the NGO. This particular approach based on individual perceptions might not satisfy all analysts, considering 10% of the respondents are foreign correspondents in the country they evaluate, as noted by Deutsche Welle. For the time being, the specialized prosecutor for crimes against freedom of expression (Fiscal Especial para la Atención de Delitos Cometidos en Contra de la Libertad de Expresión) — a branch in the Office Mexico's Attorney General — has not issued any statement regarding the 2014 World Press Freedom Index.